»AQUA SANITAS« means water of health in latin, so there is no coincidance this bottle is called Aqua Sanitas. Usually best things are the simplest, so again there is no coincidance – Aqua Sanitas is very simple and easy to use. 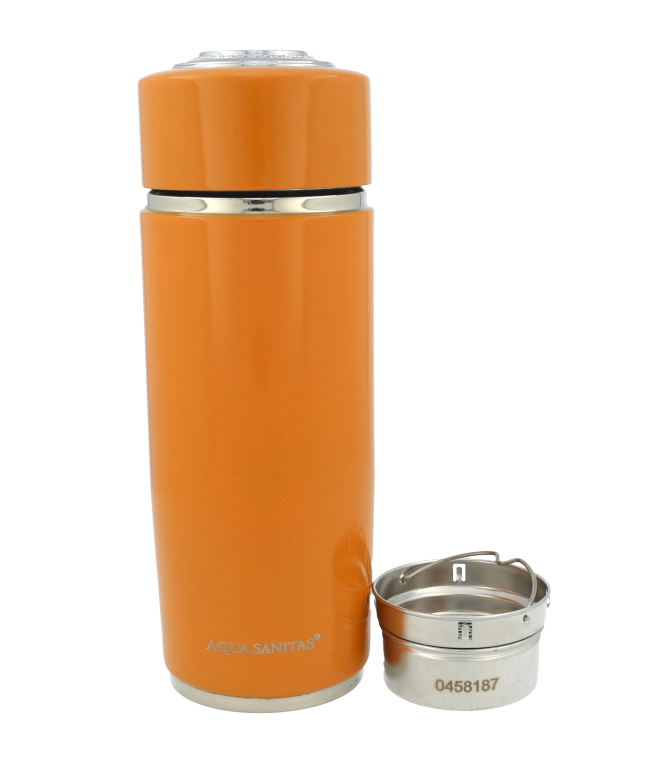 It is made of stainless steel and comes with two filters containing a patent combination of 13 natural minerals. Pour drinking water into the Aqua Sanitas bottle and let it rest for at least 5–10 minutes. AQUA SANITAS is available in 8 different colour combinations. Pick yours! 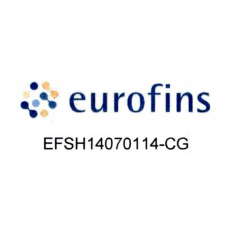 And receive regular reminders to clean the filter and thereby ensure optimal operation of your bottles. Japan has the highest number of people which are 100+ years old, with ever increasing numbers. Currently, the number lies by about 50.00 people who are 100 years or older. Scientists tried to figure out why this just happened in Japan. What they found was very surprising. Among other things, they examined, the drinking water in Japan. They learned that there the water it is richer in minerals, has a higher pH and a low reduction potential. The normal pH of our body fluids lingers at 7.2 – 7.4. If the pH value goes below, it negatively impacts on our immune system and therefore on our health. 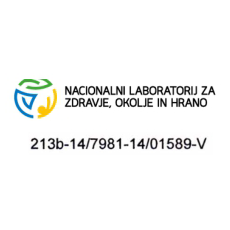 Allergies, metabolic- and other diseases may occur. For example, the pH of a person suffering from cancer is approximately by 4.5 – 5.5; way below any health promoting level. Therefore, the immune system must work very hard to get the body back to a healthy state – if at all. Poor lifestyle habits, as well as inadequate nutrition, lack of exercise, stress and pollution all play their part to affect further negatively on our immune system. Based on the Japanese water study, it seemed logical, if you want to create healthy water, you have to adapt it to the Japanese water values. Scientists assumed because the human body is composed of 70% water; if you want to change the pH you have to make the changes in the water, you drink as well. This consideration led to the birth of AQUA SANITAS – The smart way to drinking water. What makes AQUA SANITAS unique? 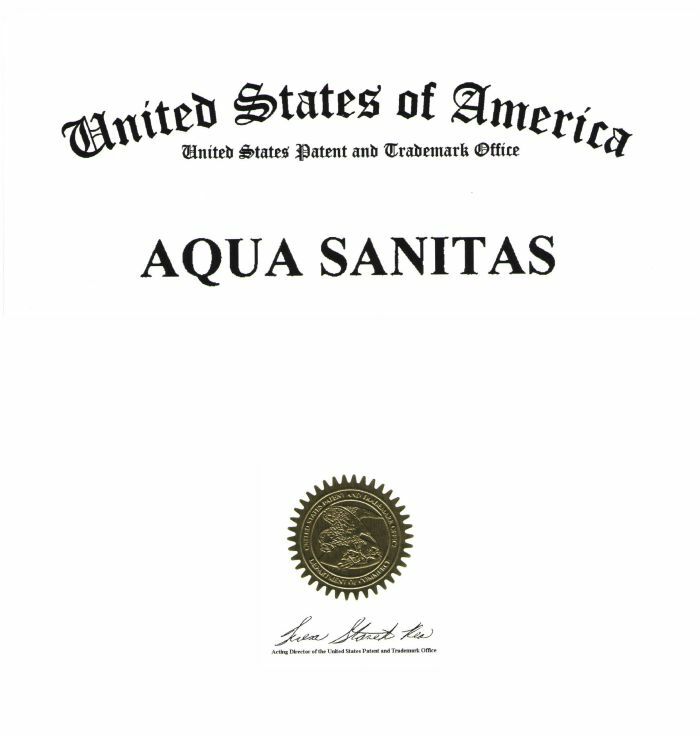 AQUA SANITAS is the only bottle on the market that not only filters through its unique filters and minerals but after just 10 – 15 mins it ionizes and alkalizes your water. This means the harmful acidity is reduced by raising the pH to a health-promoting level. A smart bottle, but how does it work? As already mentioned, AQUA SANITAS consists of two filters. One is attached to the bottom of the bottle; the other is at the upper end. Both filters are fitted with 16 natural minerals that are scientifically proven and patented. 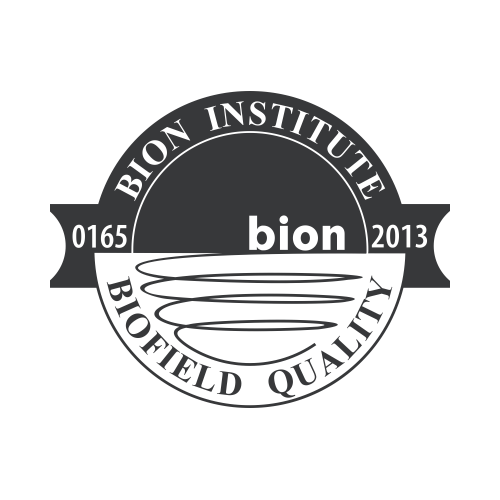 The bottom filter includes slow-soluble minerals, which are released over no less than five years into your drinking water. This means your AQUA SANITAS bottle has an actual lifetime of five years. This bottom filter is fixed in the bottle and cannot be removed nor moved. 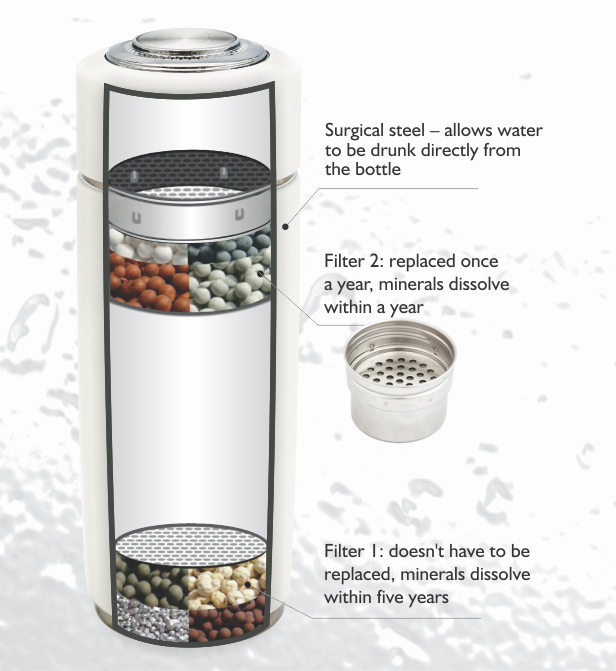 The top filter contains minerals, which release more quickly into the drinking water. This filter can be changed. If you consume three liters of water per day from the AQUA SANITAS bottle, you have to replace the filter after 12 months. This top filter also stops the larger water particles from getting into your drinking water. After 10-15 minutes is your drinking water is ready – a potent antioxidant that protects you not only from the free radicals but also slows the aging process. Research in bioenergetics also found that after drinking from the AQUA SANITAS bottle the environment of the person concerned is significantly harmonized. AQUA SANITAS is also ideal for the hydration of the body during or after strenuous work or exercise because the water molecules not only distribute better but they also form to different groups. This enables them to reach a greater number of cells. This leads not only to a better hydration but also to increased oxygen. These oxygen increased water molecules travel through the bloodstream and eventual reach your brain. Increased oxygen is incredibly important for all mental processes, taking in and processing of information as well as your concentration. It goes without saying that this bottle rightfully earned the reputation as the most intelligent bottle in the world. Scientifically proven and confirmed by many customers, CHANGE THE WATER you drink WITH AQUA SANITAS, AND it will CHANGE YOUR LIFE.